Tesco Finder App for iPhone, Ipad and iPod Touch. Iphones are available in numerous models and varieties. These iphones has varies number of application to improve their text and videos. Such a type of application is the tesco iphone app. This application has large number of uses like we can do online shopping. Tesco have released their iphone App after overcoming a small technical problem last month which saw it get denied from Apple’s App store. The problem was corrected with a minor change and is now available for download. This application has wide usage. The App which was created by Tesco website IT innovation club, allows for users to locate their nearest Tesco, and once there they can also use the App to locate any food product in the store by having the App describe the aisle and shelf. Tesco iphone app is used in many of the shopping malls to know where the products get located. The App which was designed to help users who might face problems outside the standard work hours, has got future improvements already in the works, including the ability to see the prices of items in real-time. Over a 1000 users have already downloaded the application since the weekend and this is set to rise much higher. So it is so easy to download this iPhone application. 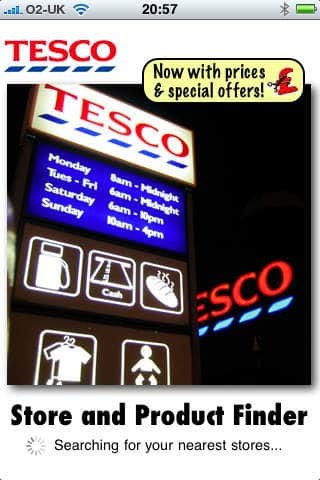 This type of tesco app for iPhone can be used in any type of iphone. Tesco app is mostly used in the shopping and departmental areas where we find difficult to find the food products we need. Tesco, being an innovative retailer that they are, attempted to get an iPhone shopping app into the apple store and onto shopper’s iPhones last month, however they failed to impress due to minor technical issues and Apple kicked the app back. Now the supermarket chain has resolved the previous issues and has managed to get the app stocked with the App Store. The Tesco finder iphone app allows the savvy shopper to find the nearest Tesco store and product location with aisle and shelf location info displayed for food items only at present. The app has a long way to go in terms of sophistication as the app will find a store and limited item locations. It also provides details about the latest price of the food products. Download this Tesco finder App for iPhone, iPad or iPod Touch Here. Digi-Key App for the iPhone Now Available in Europe!